"Cave Men -- that's what most of us think when we envision Neanderthals. The truth is -- Neanderthals utilized language and tools, played musical instruments, possessed strong social ties, and practiced religious rites. Listen and learn!" 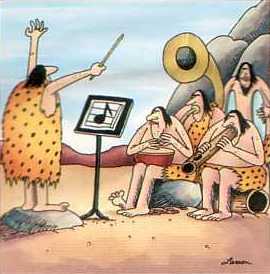 "There's overwhelming evidence that Neandertals were musically inclined." The first evidence cited is a piece of a bone from a bear, which seems to have 4 regularly-spaced holes and looks like it could have been a part of a flute. The jury is still out on whether this is a genuine musical instrument or not. "Many of these items were discovered in the Neander valley of Germany where the very first Neandertal fossil was discovered in 1856. For instance a tuba, a musical instrument made from a mastodon tusk, what looks like a bagpipe made from a part of an animal bladder, a triangle, and a xylophone made from hollowed out bones." Sadly, however, it was all an April Fools joke. See a copy of the original article from Discover, along with replies from readers. There is no Hindenburg university as far as I can discover, but the Hindenburg is famous as the hydrogen-filled airship which was destroyed in a catastrophic blaze in 1937 (Note to self: avoid making a connection between the ICR and flaming gasbags. oops..). "Todkopf" is a concatenation of the German words for "death" and "head" (an allusion, perhaps, to the band The Grateful Dead , whose fans are known as 'Deadheads'?). Bizarre statements by 'Todkopf' about how the Neandertals might have played the bagpipe with their noses, and about how they might have scared away game with their music, should probably have been a tip-off that the article was a spoof. The painting, of course, is also part of the hoax; there are no known Neandertal cave paintings. P.S. : On November 1st, 2000, (about 7 days after this page was published on the web), the ICR issued a disclaimer apologizing for their error. The segment discussing the hoaxed musical instruments has been removed from the downloadable copies of the show. The statement about "overwhelming evidence" for Neandertal musicality remains, though it sounds out of place now that 80% of the evidence has disappeared and only one (disputed) instrument remains. The December 2000 issue of Acts and Facts , the ICR's newsletter, also contained an apology for their use of the hoax. P.P.S. One former paleoanthropology graduate student I know told me that he had really enjoyed Discover's April Fool joke, except for the fact that it was so obviously a hoax that no one would fall for it. Clearly, he had not reckoned on the expertise of the ICR's paleoanthropology department! P.P.P.S. And now (April 2005) a reference to the same article has appeared in an article by Brad Harrub which is on the Answers in Genesis website! (the reference was silently removed a few days after I pointed it out). Go to this post at Panda's Thumb for more about Harrub's article. I pointed out another howler in it (also now silently removed from the online version), which made it past Answers in Genesis's "peer review" process to get published in their Technical Journal.